Bigelow Aerospace's Genesis 2 spacecraft is a near twin of Genesis 1, seen here in this self-portrait after its July 2006 launch. Thisstory was updated at 8:08 p.m. EDT. Aprivately-built space station prototype successfully launched into orbitThursday from a Russian missile base, kicking off the second test flight forthe U.S. firm Bigelow Aerospace. Genesis 2,an inflatable module laden with cameras, personal items and a Space Bingo game,rocketed spaceward atop a Dnepr booster from a silo at Yasny Launch Base, anactive Russian strategic missile base in the country's Orenburg region. Liftoffoccurred at 11:02 a.m. EDT (1502 GMT) though it was near evening at the Russianlaunch site. "It was beautiful,? BigelowAerospace corporate counsel Mike Gold, who attended the launch, told SPACE.comimmediately after the Dnepr blastoff. "Genesis 1 is about to havecompany." Genesis 2 is a near-twin of Bigelow Aerospace's Genesis 1module, which launchedin July 2006 and remains operational today, but carries a series ofenhancements and additional cargo, the Las Vegas, Nevada-based spaceflight firmhas said. Both spacecraft are prototypes for future commercial orbitalcomplexes that Bigelow Aerospace, and its founder and president Robert Bigelow,hope to offer for use by private firms andnational space agencies. Gold added that the launch and orbiting ofGenesis 2 was the first step, with ground operators anticipating to hear fromthe spacecraft via ground stations to verify its health and status. An initial signalreceived at 6:20 p.m. EDT (2220 GMT) relayed that Genesis 2?s batteries werepowering up, as well as the expected air pressure, but firm data on solar arraydeployment and the vehicle?s successful inflation will come later, officialssaid. ?Thisis excellent news,? Gold said on confirmation that Genesis 2 was operating wellin Earth orbit. ?I?m a little overwhelmed right now. We still have steps to gothrough. We?re early in the mission?but this is all good news.? Mid-afternoon rains brought some concern thatthe launch would be delayed, but the showers cleared in time for liftoff. Abrief communications issue in Russia also delayed confirmation that Genesis 2separated from its Dnepr booster, prompting a few tense moments. ?Any deviation from nominal magnifies the anxiety,"said Bigelow Aerospace program manager Eric Haakonstad in a statement. "When it came in four minutes later, it was a big relief." Thursday's launch came after a series of delaysfor Genesis 2, most recently due to return to flight efforts by Dnepr rocketlaunch provider ISC Kosmotras. The joint Russian-Ukrainian firm launched twosuccessful flights on April 17 and June15 this year to recover from a failed July 26, 2006 space shot. The Genesis2 module sports a similarlook as its Genesis 1 predecessor, but carries a suite of new sensors andavionics to monitor and control the spacecraft in orbit. The sensors will watchover internal pressure, temperature, vehicle attitude control and radiationlevels, Bigelow Aerospace officials said. Once inspace, the 15-foot (4.4-meter) module is designed to deploy eight solar arraysand expand from its launch width of 6.2 feet (1.9 meters) to a flight diameterof eight feet (2.54 meters). Genesis 2 carries 22 cameras - more than the 13imagers aboard Genesis 1 - to record scenes within the spacecraft's 406-cubicfoot (11.5-cubic meter) volume. Unlike itspredecessor, Genesis 2 also sports a multi-tank system to inflate the modulewith compressed air. That improvement, the firm has said, addsvital redundancy in the inflation process and allows better control of thecraft's gas supplies. If all goes well, Genesis 2 is expected to have a longorbital life akin to that of Genesis 1, which continues to operate nearly afull year after its July 12, 2006 launch. Bigelow Aerospace officials said theolder module may even continue to function through the next eight to 13 years. 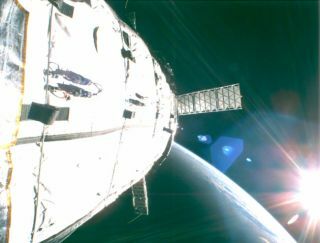 Genesis 2is the first Bigelow Aerospace module to carry a clutch of personal items underthe firm's "Fly Your Stuff" campaign, which allowed paying customersto load photographs and other possessions to ride into orbit and be captured byonboard cameras. Also tuckedaboard Genesis 2 are a Space Bingo game and Biobox filled with ant farms,scorpions and Madagascar hissing cockroaches. The SpaceBingo game is chiefly aimed at entertainment, with no actual wagering involved,and is slated to begin operations a few months after launch. Bigelow Aerospaceofficials said the so-called Bingo Box will use fans and levers to autonomouslymix and select bingo balls during games presented on the firm's website: www.bigelowaerospace.com. Genesis 2'sBiobox, meanwhile, is a three-chamber pressurized vessel with compartments forbiological specimens to be observed by onboard cameras. In additionto the hissing cockroaches, the same type that flew aboard Genesis 1, theBiobox's chambers contain a group of South African flat rock scorpions, one ofwhich was named Antares by a fifth grade class in Pennsylvania. A farm ofCalifornia red harvester ants rounds out Genesis 2's biological payload, thecamera views of which are expected to be available on the Bigelow Aerospacewebsite during the mission. The Genesis2 and 1 modules are one-third scale versions of Bigelow Aerospace's plannedmanned orbital vehicles that are expected to begin flying as early as 2010. Next year,the firm plans to launch Galaxy - another pathfinder module that builds on the Genesisvehicles - before flying its first crew-rated spacecraft Sundancer in 2010.Galaxy is slated to have 45 percent more habitable space than the Genesiscraft, with a pressurized volume of about 589 cubic feet (16.7 cubic meters). Thethree-person, 6,356-cubic foot (180-cubic meter) volume Sundancer is expectedto be bolstered by the addition of a connecting node and propulsion bus in 2011to lay the foundation to support Bigelow Aerospace's planned BA 330 module. Thelarger BA 330 is expected to include an 11,653-cubic foot (330-cubic meter)habitable volume, when fully inflated, and is slated to dock with Sundancer andits node-propulsion bus by 2012. In pre-liftoff action Thursday, due to the rainat the launch area, a baseball game that included Robert Bigelow was playedinside the large satellite integration and test building on the base. ?Justanother example of Bigelow Aerospace innovation?we don?t let anything stop us,?Gold said. Gold noted that technical and procedural changeshave been made of late to the Dnepr launch-for-hire business. Those changeswere demonstrated by two recent successful launches of the booster. Steps takenwere brought about due to a July 26, 2006 failure of the Dnepr booster. ?With Genesis 1 we put one foot ahead of us.With Genesis 2 we put another foot ahead of us which means that we?rewalking," said Gold. "I look forward to running and what that?s goingto be like at Bigelow Aerospace.? SPACE.comspecial contributor Leonard David contributed to this report from Boulder,Colorado. VIDEO: More on Bigelow Aerospace's Inflatable Modules and Space News TV.